Career, love, happiness—for Mina Rezayi, everything becomes a gently humorous negotiation between her Iranian heritage and her American hopes, between her mother and herself. Mina, who would rather be an artist than finish her MBA, flinches at the thought of another Sunday tea with a Mr. Possible. But she cannot disappoint her mother, Darya, a gifted mathematician, who, in pre-revolutionary Iran, had dreamed of becoming a professor. An arranged marriage to Parviz, whom she eventually came to love deeply, and three children, however, dashed those plans. After escaping the oppressive Islamic regime and making a home in America, Parviz works hard, earns an American medical license and brims with irrepressible optimism. He channels his enthusiastic you-can-do-it attitude into convincing Darya to start a Saturday afternoon math camp. With only two other members—Yung-Ja and Kavita—the club is the highlight of her week, and the women engage in complex mathematical acrobatics as well as competing over whose homeland has suffered the worst upheavals. Sighing with exasperation, Darya even allows Parviz to register her for a night class on spreadsheets, where she meets Sam, who’s just a friend, right? Constructing complex graphs, charts and spreadsheets, Darya evaluates potential husbands for Mina. So far, her matchmaking efforts have been thorough yet unsuccessful. But one Sunday, Mr. Dashti comes to tea. And Mr. Dashti looks strangely relieved when Mina rejects him. His unexpected reaction intrigues Mina, and she begins to dream about returning to Iran. Maybe there she could resolve her own identity crisis. To her surprise, Darya decides to accompany her. Deftly threaded memories of Iran and of the revolution’s effects on their family enrich the story as Mina and Darya gain sympathy for each other’s struggles. 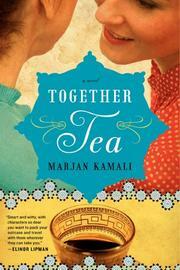 Sparkling dialogue and warm characters make Kamali’s debut novel perfect for book clubs.